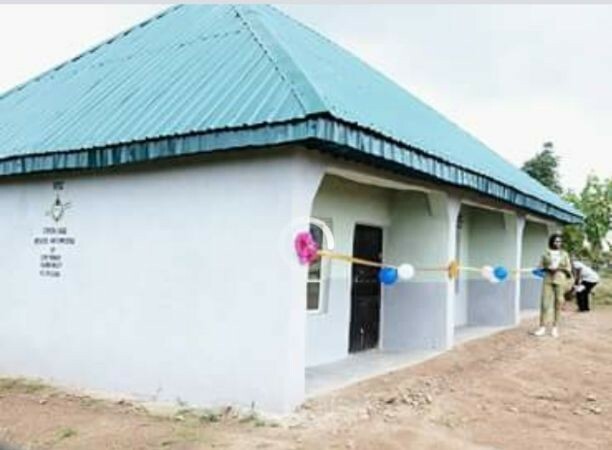 A serving member of National Youth Service Corps (NYSC) in Kaduna, Onyinyechi Beauty Solomon has initiated and built a three-room corpers’ lodge at Government Secondary School, Fadia, Tudun Wada in Zangon Kataf local government area of the state. The corps member, who hailed from Abia State said, the project was her contribution to her host community as her community development service (CDS), the third cardinal point of NYSC. In appreciation, Miss Onyinyechi Solomon was conferred with the chieftaincy title of GIMBIYA Fadia meaning a lady of worth in the King’s palace by Fadia traditional council. According to her, “the project was my little effort to address one of the challenges that confronted my host community of service. “With the lodge in place, the community will never lack the presence of NYSC members to drive development efforts in the area and I am so happy God used me to get this done with support from the people of the community. I equally thank the NYSC for given us the platform”, she said. Commissioning the landmark corps project yesterday in Zango Kataf, Coordinator of the scheme in Kaduna, Walida Siddique Isa said, the scheme will always support excellence in all its programmes across the country. The Coordinator described Gimbiya Beauty Solomon as a shining star among her peers just as she enjoined other Corps members to emulate her exemplary contribution and conduct during her service period in Kaduna state. The event was witnessed by parents of Onyinyechi and a large turn out of appreciative indigenes of the area, government representatives, NYSC staff and corps members amidst encomiums.